Lianna Aghajanyan likes knitting. She doesn't like being called a refugee. In 1992, after months of living in their basement while bombs fell in their village of Shahumyan (now occupied by Azeri forces), Lianna's family escaped to Russia. She was 14. At age 17, the teenager moved to Yerevan to live with an uncle's relatives. Now, she lives alone in a one-room apartment in the Shengavit district of Yerevan. When she gets lonely, she goes to visit relatives. But when she simply needs to be busy, she knits. "In Shahumyan, almost everyone was knitting," Lianna says. "Grandmothers, relatives . . . I simply like making up different things and knitting them - socks, scarves, things for kids." And, since October, pillow covers and Christmas ornaments. Lianna is one of 10 women from (previously) Armenian villages in Azerbaijan recruited by the Norwegian Refugee Council to launch a program that the Council hopes will turn into an enterprise for the knitters. Since last Monday the women's work can be found hanging on the walls and throughout the bookstore and dining area of Artbridge, Yerevan's most popular café among expats and trendy locals. The bookstore/café is cooperating with the NRC to promote the sale of holiday-related items made by the refugee women. It is not likely that the women might have ever expected to find their work in such an upscale place. The idea belongs to NRC director Tim Straight, who prior to moving to Armenia three years ago, worked in Sri Lanka, India and Bangladesh helping develop the concept of "alternative trade" or, "trade not aid". Having become intimately acquainted with the typically impoverished conditions among refugees here, Straight decided to apply his experience to marketing a traditional Armenian craft that could have financial rewards for the women who make the goods. "Most of the refugee women are older," Straight says. "And I thought 'What do older Armenian women do? They knit'." So Straight formed a team of NRC associates and started scouring Yerevan warehouses for high-quality wool for making pillow covers. The team, it turns out, is men. "That's been a pretty interesting side effect," Straight says. "Three Armenian guys learning a lot about knitting." 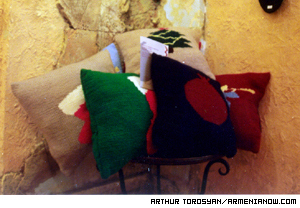 The works of 10 women are displayed at Artbridge, Yerevan's most popular cafe among expats. Straight says that, in general, people do not understand the refugee situation here, and he hopes that introducing these women through their knitting will be a good education for both the artists and those who buy their crafts. 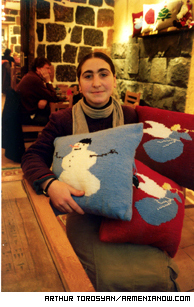 For the seasonal sale, Lianna and the others have made pillows with typical holiday designs (plus the ubiquitous Armenian pomegranate). A total of 75 pieces will be displayed at Artbridge and at a Christmas bazaar Saturday at Hotel Armenia. Each pillow (Lianna says they take about two days to make) costs $25. The women and the project team are paid a salary for the work and Straight says that the profit from each pillow will be about $4.50, which will be put back into the project. Ultimately, he hopes the knitters will form their own non-governmental organization (NGO) and become self-sufficient. "The women keep saying to me 'When is this going to stop?' And I say 'It's up to you'," Straight says. "The seed is planted and I'm hoping it will sprout." And while it is a new idea, it answers a well known problem. "We go into the villages and they say 'Yeah, I'll take a house, but I'd rather have a job'," Straight says. Straight and NRC is hopeful, as he wrote in a brochure that accompanies the items "that at one time soon, these women will be seen as the strong, resourceful people they are, rather than be stamped with the word 'refugee' with the negative connotations that word carries." Six of the knitters are from Shahumyan and four from Baku. But: "I'm Armenian," Lianna says. "Wherever an Armenian is, his native country is Armenia." In Russia, she says she felt "half Armenian". But, even in her native land, she is marked with a label. At the culture center she attends, for example, there are two choirs - one of which is for refugees. "When they say, 'And now the refugee choir will be singing' it sounds very . . . as if there were some separation," Lianna says. Straight says he is hopeful that Lianna's youth and resourcefulness will make her a leader in forming the NGO, but he is cautious about insisting that the women collaborate independent of NRC. "They have to want it," he says. "They have to decide that this is a good idea and then make it happen themselves." And with a little encouragement from sales, he hopes. "Nothing would be better," Straight says, "than if a customer in a little shop in Connecticut or somewhere would place a small order so that these women realize this could be something that can work, and not just another handout." Detailed photographs of the work are available to interested customers. For more information, write to this journal at info@armenianow.com or to NRC at tstraight@nrc.am.